Coach Bill Pintard just back in town from a 24 hour bus ride from Wichita, holds the Foresters' 6th Championship trophy. 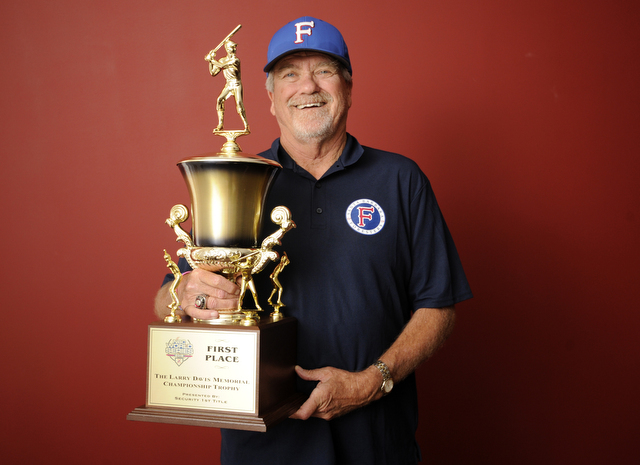 Former major leaguers Roger Clemens and Tim Hudson pitched in the 82nd National Baseball Congress World Series, but after 30 teams played ball for two weeks in Wichita, it was the Santa Barbara Foresters who brought home the trophy for a record-tying sixth time. They scored a 6-2 victory over a Kansas team, the Hays Larks, in the championship game Sunday night. The Foresters actually won two games Sunday. They rallied for three runs in the bottom of the 12th inning to oust the San Diego Force 7-6 in a semifinal that ended at 4:26 a.m., after the Larks had outlasted Hudson and the Kansas Stars in 17 innings. Texas infielder Bret Boswell, who spent his third summer in Santa Barbara, led the Foresters at the plate with 14 RBIs in six games. Texas Tech hurler Jacob Patterson was MVP of the title game. Pintard said, “Everybody stepped up,” including Colby Barrick, a reserve outfielder from Santa Ynez, who in his only at-bat in two weeks came through with a pinch-hit double that sent the semifinal game into extra innings.